Generoso and Lily’s Bovine Ska and Rocksteady: Duke Reid’s Dutchess Label 12-1-15 – LILY & GENEROSO 4EVER! Killer Derrick and Patsy on Dutchess! Hope you had a wonderful Thanksgiving! On the first day of December, we were excited to present another edition of Generoso and Lily’s Bovine Ska and Rocksteady with a special label spotlight on Duke Reid’s Dutchess label. To kick off the show, we started with a fantastic version to version cover of the Isley Brothers’ hit, “It’s Your Thing.” Delroy Wilson and Alton Ellis each took a shot at the iconic track, and the results are both impressive. After the first set of reggae, we began the second set with “Penny Wally,” a track from the Soul Defenders, followed by “Pack Up Your Things and Go” from The Overdrives, a group who recorded a limited number of gems for Lloyd Daley’s Matador label. For the mento set, we opened up with “The Walls of Jericho,” a mento from Laurel Aitken, and then closed off with Lord Composer’s “Daphne Walking,” a track from the Songs from the Caribbean LP, a release from the American ART label. Then, to prepare for the spotlight on Dutchess, we presented a set of ska that included the lovely “Too Late” from Lloyd and Glen and the too pretty “Dance With Me” from Bob Marley and the Wailers. At the top of the second hour, we were proud to present the spotlight on Duke Reid and his Dutchess imprint. We’ve had spotlights on imprints on all of the major soundsystem names from Coxone Dodd to Prince Buster to King Edwards, and in that arena of music giants, we cannot forget Duke ‘The Trojan’ Reid. Long before he entered the music industry, he served as a police officer for ten years before he changed courses. First, he opened up The Treasure Isle Grocery and Liquor Store in Kingston. And, in addition to this business, in 1953, Duke opened up his Trojan soundsystem, which was supposedly named after the Trojan van that Duke Reid drove and filled with the equipment, liquor, and records for the dances he held. Given the distinctiveness of the Trojan van and Duke Reid, when he would arrive to a location, it is claimed that people said, “Here comes the Trojan,” thus giving birth to the name of the soundsystem. Like many other operators, Duke first played R&B from America on his soundsystem but would have the itch to record his own tracks. In the late 50s, Duke first recorded 78s for his Trojan label, and when he moved to recording on vinyl, he opened up additional imprints, including Dutchess, which was named in honor of his wife and is the subject of our spotlight tonight. 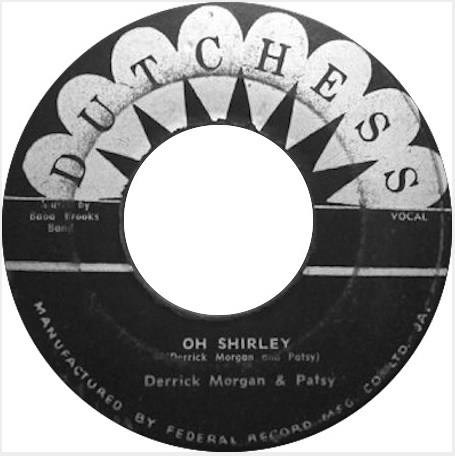 “Love Not to Brag” was an early hit for the Dutchess label and for a young Derrick Morgan. One of the earliest hits for a male and female duet; it preceded Keith and Enid’s “Worried Over You.” Derrick has said that the track was Inspired by Monty Morris, whose family was better off than Derrick’s, so he may have boasted a little bit about the things he had. You can listen to our full show from December 1, 2015 HERE. Subscribe to our show on Mixcloud; it’s FREE, and you’ll get an email every Tuesday when we post a new show.